What Is Rat Pack Jazz? the Music will be "Right!" As swingin' as it gets! 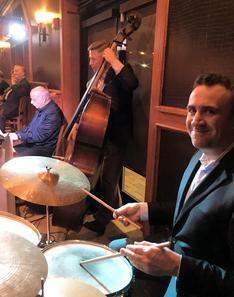 Piano, Bass, and Drums, (or more) swinging. What a classy and sophisticated sound! All Instrumental Groups are Not the Same! Absolutely the best in Chicago! "My guys just sound better and... they play the right stuff"
there are plenty of mediocre, low cost, and just plain boring jazz trios out there. As you can well see and hear in the above videos, my guys do not fall into that category!" No usage or reproduction of any kind is permitted without prior written consent from Rat Pack Jazz.com and this Dean Martin Impersonator and Dean Martin Tribute for Corporate Entertainment, Casinos, and Special Events, serving Chicago, Palm Springs, New York, San Francisco, Las Vegas, Atlantic City, Los Angeles, St Louis, Phoenix, Cincinnati, Indianapolis, Minneapolis, Des Moines, Milwaukee and cities Nationwide. All content and images on this website are copyrighted. All Rights Reserved.